CLEMSON, S.C. (AP) — While Clemson coach Dabo Swinney feels like this season has gone by quickly, his time with his record-setting seniors probably has slipped by even faster. Clemson (10-0, 7-0 ACC) looks to complete a perfect run through the Atlantic Coast Conference regular season when it faces Duke (7-3, 3-3) on Saturday night. The Tiger seniors are 50-4 since arriving at Clemson and have a chance to set an ACC mark with their 51st victory, not to mention their three previous ACC championships and the 2016 national title they picked up during their time. The 33 seniors are led by familiar names like defensive linemen Christian Wilkins and Austin Bryant, receiver Hunter Renfrow and linebacker Kendall Joseph that Swinney — or Tiger fans — won’t soon forget. Each one will get to feel that at Death Valley a final time before the game when, as is Clemson tradition, they’ll make a solo run down the hill onto the field in front of a packed house. Clemson offensive coordinator said Wilkins has been a difference maker since stepping on campus. Big things were expected and Wilkins delivered, Venables said. Of course, all the Tigers understand there’s work ahead for them to finish things off in the best way possible. They’re looking to stay on track for an undefeated season and stay sharp for an ACC championship game and College Football Playoff run next month. Duke coach David Cutcliffe believes Clemson may be as challenging an opponent as he’s faced the last few decades. “We prepared for a lot of great football teams over 30 plus years but this team is complete,” he said. These teams from different ACC divisions have not played each other since Clemson’s 56-20 win at Duke in 2012. The Tigers have won four straight in the series. Duke’s last win came at home in 2004. But Swinney said Hyatt had improved and was expected to play. Duke quarterback Daniel Jones passed for more than 300 yards and ran for more than 100 in last week’s win over North Carolina. It’s the second time he’s done that, giving him two of Duke’s three games all times with such numbers. Jones also joined Clemson quarterback Tajh Boyd and Louisville’s Heisman Trophy winner Lamar Jackson as the only ACC passers with multiple 300-100 games. Clemson has plenty of talented seniors like Wilkins and linebacker Kendall Joseph who’ll be drafted by the NFL next spring. A couple of draft-eligible Tigers are taking a wait-and-see approach to the next level. 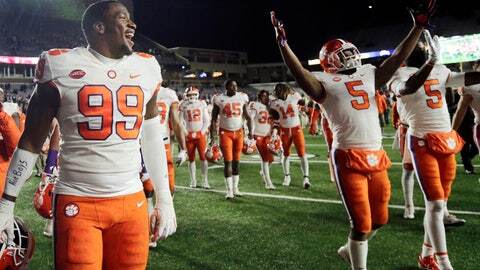 Defensive end Clelin Ferrell and tackle Dexter Lawrence are both juniors not ready to commit to leaving. Both have said they’ll decide sometime after the season. Clemson is looking for its fourth-ever 11-0 start, joining teams in 1948, 1981 and 2015 who’ve accomplished the feat. The 1981 group finished 12-0 and earned the school’s first national title. In 2015, the Tigers started 14-0 before falling to Alabama in the national title game.